Just in time for my birthday (which is coming up on Monday the 22nd!) so many retailers have launched promotions this weekend to celebrate!! In honor of all of our January birthdays and unbirthdays there are more great deals on new clothing than I’ve ever seen — fodder for another discussion post surely. Habit has me starting with Anthropologie, where for ‘a limited time’ all full priced clothing is 20% off. A limited time probably means through Monday but that’s not confirmed. There’s also Free Shipping on orders of $150+. It’s basically an Anthro Day weekend without officially being called an Anthro Day weekend. Of course, most of my wishlist is jewelry and bags which is where the Birthday Discount will come in handy. In clothing I have a much shorter wishlist but there are some highlights, like the Level 99 Button-Front Pencil Skirt ($105 + 20% off, above) which I of course just ordered last night and will have to request a PA on. It’s not the only skirt on my wishlist — last night I tried on the Cordoba Tulle Skirt ($148 + 20% off) and fell in love with it…even though I’m not sure exactly where I’ll wear it yet. (Work? Blog outfits? Everywhere just because???) I think I have to have it. There are a few new arrivals that have caught my eye, like the Cloth & Stone Raw-Hem Shirtdress ($138 + 20% off) and the Kitzy Gingham Dress ($358 + 20% off), because I guess Anthro is carrying Petersyn now? 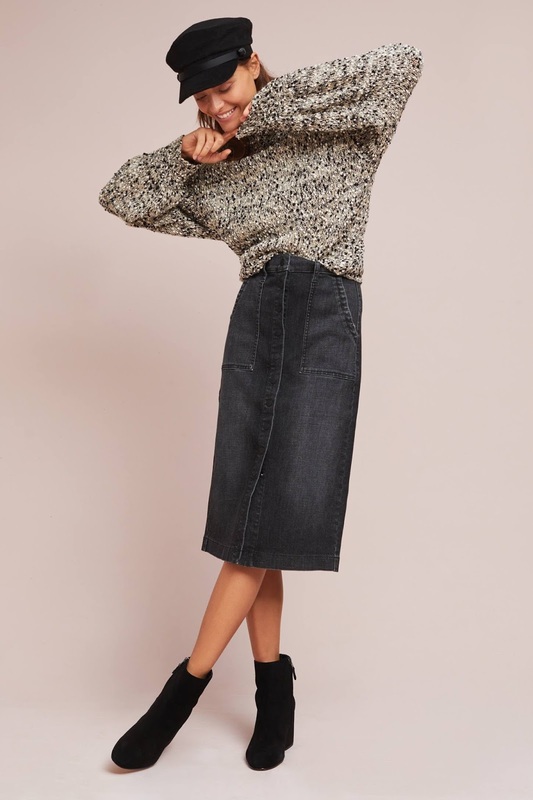 I also adore the look of the Pilcro Eyelet Denim Jacket ($148 + 20% off) but of course it looks super-short because Anthropologie does not know how to make tops long enough for the average torso and it continues Pilcro’s troubling trend of making each iteration of an item $10 more expensive. Ugh, it makes me so frustrated. It’s kind of a bummer that this promo only works on clothing, but I’m guessing that’s where Anthropologie needs revenue help right now. I can’t wait for the next quarterly call where the leadership team insists that they’re righting the apparel ship! Uh huh. Sure guys. Either way, I’m grateful for the timing of this promotion. Briefly, here are some of the other promotions happening this weekend. American Eagle is offering 25% off (Aerie is excluded) with the code SAVE25. I’ll have a full post with outfit ideas for this one over the weekend but if you’d like a sneak preview check out my new Shop the Outfit board on Pinterest! Boden is offering 20% off their preview site with the code 1D7P. I’ll try to update this post with picks if time allows. LOFT is offering 50% off everything again this weekend! They are nailing it right now — I just picked up this comfy, perfectly long top in both colors. This post will be updated with more promotions! Are you shopping any of these fantastic deals? Yup. Ditto. I decided they had deleted my wishlist for the last time . . . .
Oh! I didn't know "saved for later" could hold that much. Good to know….thanks! I have not been able to use save for later. Maybe because I use a wishlist. For those wishing to Deley, you actually seem to have to delete something twice for it to come off the list. After the deletions I am not so wedded to the list but still find it a way to track pop backs. No wishlist for me either since they changed the whole set up😬 I feel it’s a waste of time. I think you should go for that tulle skirt, Roxy. It can totally be made into an everyday skirt with a tee and either a denim or leather jacket and some flats of funky boots. LOVE the color. For anyone in the Boston area, the sale items at the Harvard Square store are an additional 50% off! ha so did I in the beginning of the month-no more shopping for me until February. Plus I’ve been trained to wait for sale anyway which is always a better deal than 20/25/30% off. In my eyes that is the most fatal mistake that Anthro has made – they trained us to wait until things got really cheap, so now we do. You can't come back from that. Remember when their big Anthro Day Sale was only 15% off and it was just one day? I always bought something, and I always made the effort to get to a store. Now I can even sit out a 30% off sale. They've totally cheapened their brand. I hate how I go to store and don’t find anything I really want. What a bummer Anthro!!! I know, Nam. I've been going to Free People and Sundance for my hit of unique things that make me smile. Consignment stores, too. Great places to shop Anthropolitan ❤️I’m so crazy about Sundance lately. I went to store and couldn’t find anything I really really wanted so just got Ribbed Shimmered wide leg pants from feather bone ( as lounge pants). That table is so cute! Thank you Nam! No worries, I totally understand!! Busy at work is usually a very good sign though, so it's all worth it. There was a beautiful Floreat v-neck cami with lace trim that I saw just before Christmas. I think it came in black and cream. Does anyone happen to know the name of it? I wanted to buy it then but was concentrating on shopping for others. Now it is all about me! The Anthro new arrivals are not giving me any hope that things have or will be changing. A lot of weird and homely stuff! Not ordering anything on this promo. Will they EVER come around? Nothing new for me, but I was glad to get price adjustments for a couple of Saturday Sunday pieces from Anthro (brushed fleece cardigan and brushed fleece turtleneck dress, so cozy and soft). I would like to get some of the Sol Angeles tees but I just can't justify spending $70-90 for a tee shirt, no matter how cute. I got the Tracy Reese blue and brown plaid skirt! I am so excited for it to come! I wanted a bunch of earrings too, but alas they weren't on sale!